A French tourist was beheaded by Algerian jihadis linked to Islamic State (ISIS) militants in Iraq and Syria to avenge airstrikes by France in Iraq. Herve Gourdel, 55, was in the captivity of the Islamist group Jund al-Khilifa since the weekend. He was abducted on Sunday while on holiday in Algeria. 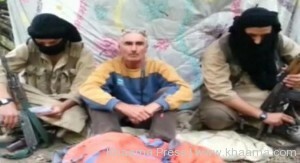 The group released a video entitled Message in Blood for the French government showing the beheading of Gourdel. The kidnappers had threatened to kill Gourdel in a video on Tuesday unless France ceased its air strikes in Iraq, where ISIS terrorists control vast swaths of territory under the guise of a ‘caliphate’. “This armed group has asked me to demand that you do not intervene in Iraq. They are holding me hostage. I beg you, Monsieur President, to do all in your power to get me out of here,” Gourdel said in a short message to French President François Hollande. The air force of France joined the United States last week in carrying out strikes against Isis positions in Iraq.